Xotic BB Preamp Review – Best Guitar Distortion Pedal? 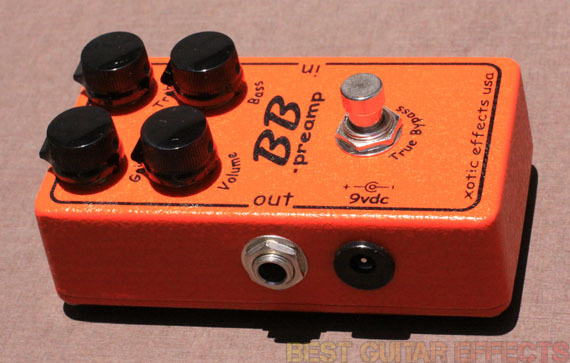 There are few pedals as hard to classify as the Xotic BB Preamp. At first glance I assumed it was just another distortion pedal. But the BB Preamp aims to be a lot more than that. With uses ranging from a transparent clean boost, to a blistering overdrive, or a singing distortion, this pedal has garnered a reputation among players in the know for satisfying any of those diverse needs and more. In my Xotic BB Preamp review, I’ll help you decide if this is the best guitar distortion pedal for you. Let’s do quick comparison of the BB Preamp with the AC Booster and RC Booster pedals. The RC Booster is primarily a clean boost pedal offering 20db+ of boost, while the BB Preamp offers 30db+ of clean boost. However, the BB Preamp break ups fairly quickly, taking it into overdrive territory once you start turning the Gain knob. The AC Booster functions primarily as an overdrive, while the BB Preamp can surpass it in gain to enter lighter distortion territory with a subtle compression at higher levels. All 3 are versatile pedals, but while the RC Booster and AC Booster may handle your clean boost and overdrive needs, the BB Preamp serves as more of a hot-rod mod to the front end of your effects chain and amp, so to speak, to potentially cover all bases. More about that later. Let’s run down what all this pedal has to offer. 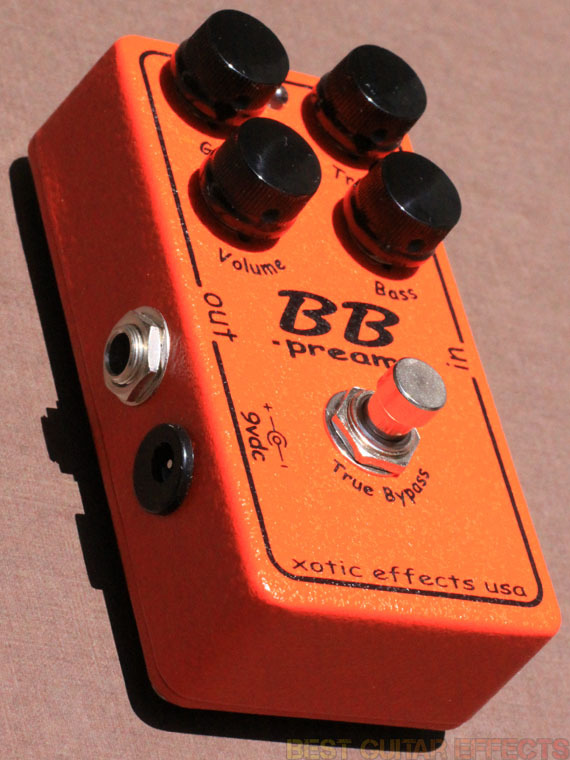 Visit Xotic Effects for more info about the BB Preamp. I plugged in my Gibson SG and went straight into the BB Preamp into a flat clean amp setting. With the knobs on the BB set to noon, I learned something as soon as I kicked this pedal. The BB Preamp is loud. If you have ever had a problem being heard, this pedal will change that immediately. I pulled the Gain nearly all the way down, lowered the Volume slightly, and pushed the Bass and Treble a bit to match my tone with the pedal disengaged. 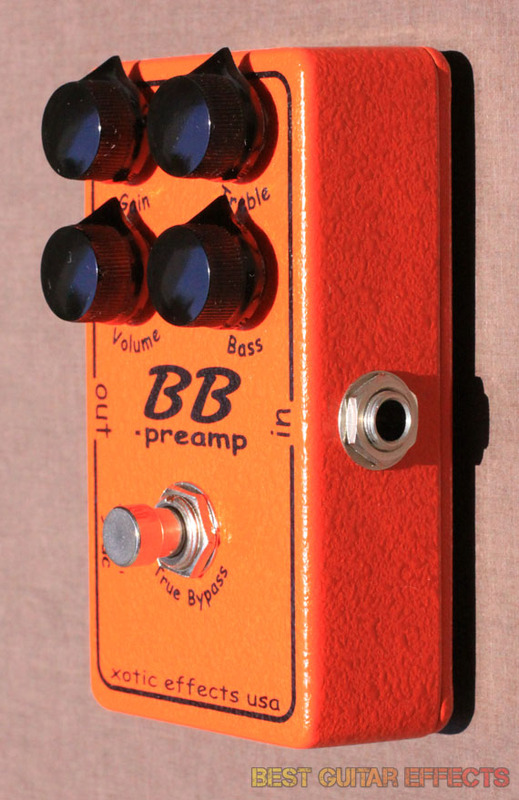 The BB Preamp certainly delivers if uncolored tone with a little boost is what you’re after. But pulling down the Volume and Taking the Gain up really brings your sound to life. The BB Preamp works very effectively as a smooth overdrive. You can really use it to find that sweet spot where your amp breaks up nicely or add in some of the BB’s smooth saturation to compliment your amp’s already overdriven tone. And all this while the pure sound of your guitar comes through brilliantly. At high Gain levels I hear a slight amount of compression that evens out your sound just a bit while providing a smooth sustain to anything you let ring out. And again, there’s always a clarity that allows the character of your guitar to come through. Even on high gain amp settings, the BB Preamp manages to provide a very useable “boost” to your tone that seems to make everything just a little fatter. And that’s without even tailoring the EQ. A slight adjustment to the Bass and Treble controls has a very noticeable effect on your overall sound. This pedal offers surprising deep, yet simple ways to hone your overall sound. This pedal plays well with others, too. I was having so much fun with the BB Preamp that I couldn’t resist running it into the AC Booster and RC Booster (Guitar → BB → AC → RC → Amp). I fired up all three pedals and was able to take the overdrive of the AC Booster over the top with the BB Preamp in front. This produced a searing lead tone that I was able to manage with the EQ settings of the RC Booster. And the BB Preamp sounds satisfyingly crunchy behind the AC Booster as well. I highly recommend trying the BB Preamp with your favorite overdrive guitar pedals and seeing what great sounds you’ll find. The BB Preamp is one of those rare tone-defining pedals that you use to carve out your signature sound or simply leave on all the time. It’s clear that this pedal goes for a Marshall “Bluesbreaker” vibe (hence the “BB”), but if you’re also curious about a Marshall Superlead/Superbass style pedal, check out the Xotic SL Drive for comparison. The Xotic BB Preamp overs a level of versatility rarely achieved in a distortion pedal. To even label this pedal as simply a distortion effect doesn’t do it justice as the BB Preamp functions as a superb clean boost and overdrive. It’s one of those true workhorse pedals that can do the job of several with ease. The BB Preamp may change what you expect from a boost, overdrive, or distortion as it blurs the lines of classification. If a diverse range of uses and pristine tonal clarity are important to you, the Xotic BB Preamp may just be the best guitar distortion pedal to suit your needs. That concludes our Xotic BB Preamp review. Thanks for reading. Want to buy the Xotic BB Preamp?